Reading and share top 10 famous quotes and sayings about God Being There For Me by famous authors and people. Browse top 10 famous quotes and sayings about God Being There For Me by most favorite authors. 1. "Ivanov: No, my clever young thing, it's not a question of romance. I say as before God that I will endure everything - depression and mental illness and ruin and the loss of my wife and premature old age and loneliness - but I cannot tolerate, cannot endure being ridiculous in my own eyes. I'm dying of shame at the thought that I, a healthy, strong man, have turned into some sort of Hamlet or Manfred, some sort of 'superfluous man'... devil knows precisely what! There are pitiful people who are flattered by being called Hamlet or superfluous men, but for me it's a disgrace! It stirs up my pride, I'm overcome by shame and I suffer..."
2. "I want neither a terrorist spirituality that keeps me in a perpetual state of fright about being in right relationship with my heavenly Father nor a sappy spirituality that portrays God as such a benign teddy bear that there is no aberrant behavior or desire of mine that he will not condone. I want a relationship with the Abba of Jesus, who is infinitely compassionate with my brokenness and at the same time an awesome, incomprehensible, and unwieldy Mystery." 3. "There is point in your life when you come face to face with the reality that you cannot take another step on your own. For me, I had never experienced that point, but depression brought me there. I have slowly, painfully and continually been confronted by my brokenness. Coming to terms with the fact that I am broken has been at the center of my accepting my being loved.For me, now, there exists a sense of desperate need for what God brings to my spiritual and mental self. Without His voice I cannot cope with the darkness, but with His whisper of "you are My beloved", I can take a step each day away from the chasm. I am broken but not beyond mending, not beyond love. It has been this desperation that has opened a crevice in which I am seeing Him for the first time. He is why my soul can find some peace even when my mind is dark and numb. It is this love that continually has brought me back from the edge of the impostor to the honesty of my broken, inner self"
4. "I need wonder. I know that death is coming. I smell it in the wind, read it in the paper, watch it on television, and see it on the faces of the old. I need wonder to explain what is going to happen to me, what is going to happen to us when this thing is done, when our shift is over and our kids' kids are still on the earth listening to their crazy rap music. I need something mysterious to happen after I die. I need to be somewhere else after I die, somewhere with God, somewhere that wouldn't make any sense if it were explained to me right now. 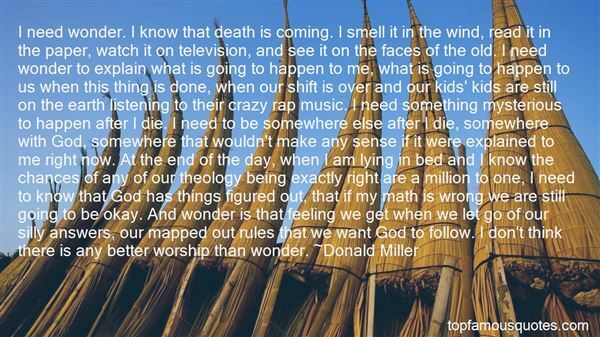 At the end of the day, when I am lying in bed and I know the chances of any of our theology being exactly right are a million to one, I need to know that God has things figured out, that if my math is wrong we are still going to be okay. And wonder is that feeling we get when we let go of our silly answers, our mapped out rules that we want God to follow. I don't think there is any better worship than wonder." 5. 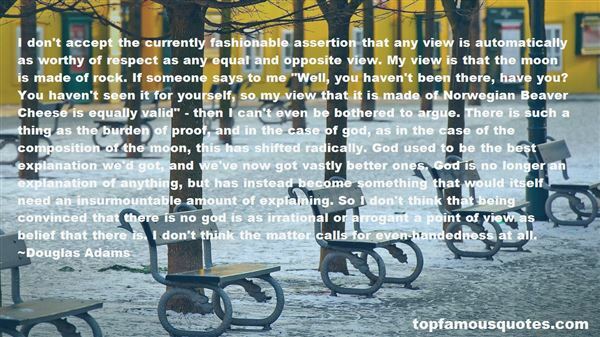 "I don't accept the currently fashionable assertion that any view is automatically as worthy of respect as any equal and opposite view. My view is that the moon is made of rock. If someone says to me "Well, you haven't been there, have you? You haven't seen it for yourself, so my view that it is made of Norwegian Beaver Cheese is equally valid" - then I can't even be bothered to argue. There is such a thing as the burden of proof, and in the case of god, as in the case of the composition of the moon, this has shifted radically. God used to be the best explanation we'd got, and we've now got vastly better ones. God is no longer an explanation of anything, but has instead become something that would itself need an insurmountable amount of explaining. So I don't think that being convinced that there is no god is as irrational or arrogant a point of view as belief that there is. I don't think the matter calls for even-handedness at all." 6. "If I'd had a good week—a real "Christian" week"—I felt close to God. When Sunday came around, I would feel like lifting my head and hands in worship, almost as if to say, "God, here I am . . . I know You're excited about seeing me this week." If I'd had a stellar week, I loved being in God's presence and was sure God was pretty stoked about having me there too. But the opposite was also true. If I hadn't done a good job at being a real Christian, I felt pretty distant from God. If I'd fallen to some temptations, been a jerk to my wife, dodged some easy opportunities to share Christ, was stingy with my money, forgotten to recycle, kicked the dog, etc. . . . well, on those weeks I felt like God wanted nothing to do with me. When I came to church, I had no desire to lift my soul up to God. I was pretty sure He didn't want to see me either. I could feel His displeasure—His lack of approval. That's because I didn't really understand the gospel. Or, at least I had forgotten it." 7. "I watched her with the crab as she ignored all my admonitions that the poor crab just needed to be set free if he was to have any chance of surviving. And God showed up there on that beach to teach me a lesson. Nothing survives when it's being smothered. Life, real life, requires being free to move about in the great big ocean, not being cradled in little hot hands that will stifle independence and creativity. We can't keep our crabs (or our kids) in a bucket and expect them to go far in life." 8. "And you know what? If there is a God, and it's that same God who's so eager to have temples built in honor of his greatness, and wars fought over him, and people dropping to their knees telling him what a wonderful, magnificent being he is? If this all-powerful, all-knowing creature for some reason just can't get by without my worship? Then let him give me some proof. Or at least get over himself if I decide to go out and get some." 9. "Oh, God in heaven, kill me now…" Rachel groaned. "I hate going to see Mrak. I always feel awkward going back to Velik Tor. After being a Scorpion for so long, after everything Oron's told us about Mrak's past…" she shook her head darkly. "I don't know if I'll be able to resist the temptation to perforate his bowels. 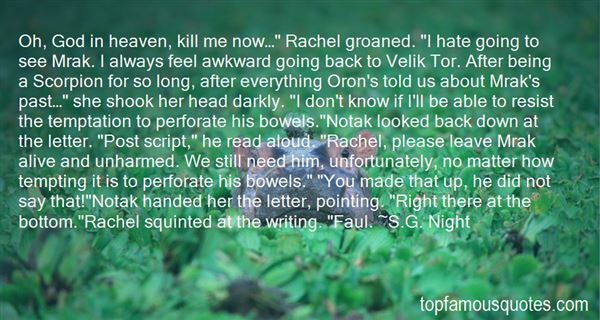 "Notak looked back down at the letter. "Post script," he read aloud. "Rachel, please leave Mrak alive and unharmed. We still need him, unfortunately, no matter how tempting it is to perforate his bowels." "You made that up, he did not say that! "Notak handed her the letter, pointing. "Right there at the bottom. "Rachel squinted at the writing. "Faul." 10. "No more junk talk, no more lies. No more mornings in the hospital getting bad blood drained out of me. No more doctors trying to analyse what makes me a drug addict. No more futile attempts at trying to control my heroin use. No more defending myself when I know I am practically indefensible. No more police using me as practice. No more ODs, no more losses. No more trying to take an intellectual position on my heroin addiction when it takes more than it gives. No more dope-sick mornings, no more slow suicide, no more pain without end.No more AA. No more NA. No more mind control. No more being a victim, no more looking for reasons in childhood, in God in anything but what exists in HERE. No more admitting I am powerless. Down the dusty Los Angeles sidewalks, down the urine stained London back alleys … there goes the connection fading into the crowd like a 1960's Polaroid."Business…? ""Whachoo need…?""Chiva…?" LE PRINCEEst-ce de l'époux ou de l'amant que vous avez peur ?LAURETTEC'est de la nuit.LE PRINCEElle est perfide aussi, mais elle est discrète. Qu'oserez-vous lui confier ?... La réponse au billet ?LAURETTEQu'en dirait-elle ?LE PRINCEElle n'en laissera rien voir à l'époux.Elle lui donne le billet ; il le déchire.Ne la craignez pas, Laurette. Le secret d'une jeune fiancée est fait pour la nuit ; elle seule renferme les deux grands secrets du bonheur : le plaisir et l'oubli.LAURETTEMais le chagrin ?LE PRINCEC'est une réflexion ; et il est si facile de la perdre !LAURETTEEst-ce aussi un secret ?"